The Battle of Britain was a time unequalled in our history - our nation’s ‘finest hour’ - and the 15th September will forever be remembered as “Battle of Britain Day” - the day that the battle was won, a day that changed the course of the War, and with it, the course of history. Marking 75 years since that historic day, The London Mint Office and the Royal Air Forces Association (RAFA) arranged a very special Battle of Britain commemorative flight. A wartime Spitfire took off from RAF Biggin Hill, with a unique cargo on board - a cache of these official Battle of Britain Gold Sovereigns. This gold coin therefore not only commemorates a crucial moment in history, it is a part of history! The cramped conditions of the Spitfire greatly restricted the number of gold sovereigns which could be flown. 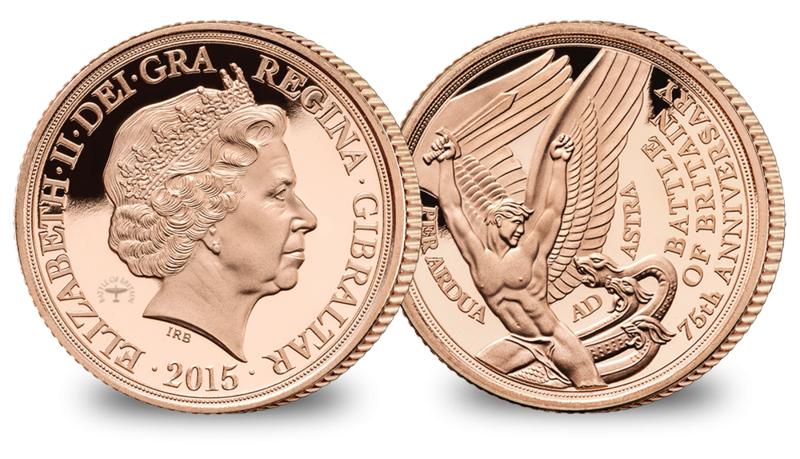 The consequence being an astonishingly low edition limit of just 150 gold sovereigns worldwide. Minted in partnership with the Royal Airforces Association the Official Battle of Britain 75th Anniversary Gold Sovereign is struck in solid 22 carat Gold, the traditional purity of all gold sovereign coins. Its design is inspired by the ‘Wings for Victory’ plaque created by an eminent British sculptor William McMillan during World War II. On the reverse the motto of the Royal Air Force PER ARDUA AD ASTRA (‘Through adversity to the stars’), encircles a winged figure about to strike a three-headed serpent. The figure represents the strength of the Allies, while the three heads symbolise the three Axis powers - Germany, Italy and Japan. This sovereign features the exclusive 75th Anniversary Flight privy mark, which verifies that it flew over the skies of Britain on the 75th Anniversary Battle of Britain memorial flight. Due to low availability of only 150 worldwide, order yours today!